Over the years, the CCP has been overtly hostile to many expressions of regional and national cultural tradition, but nowhere more so than in occupied Tibet. Therefore, programming shorts that bring Tibetan folktales to life through animation inspired by Thangka painting would not endear a film festival to the Party authorities. Not surprisingly, the Beijing Independent Film Festival did so anyway. 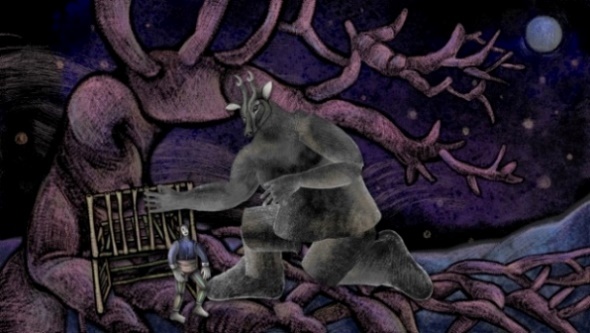 Fittingly, two of Bai Bin’s Tibetan films anchor a program of animated shorts, which screens as part of the Cinema on the Edge retrospective to the fearlessly indie fest. 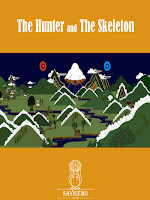 There is no question Bai Bin’s The Hunter and the Skeleton is the head-and-shoulders high point of the animated block. In this ancient tale, a hunter rashly heads off in search of game, despite the shaman’s warning. 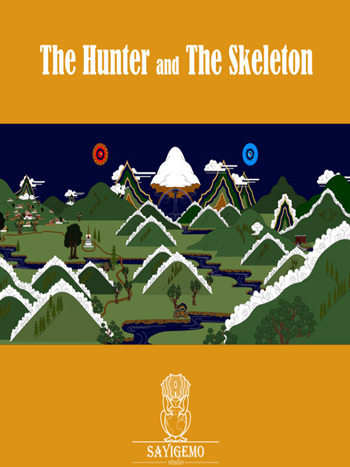 It turns out, this is an inauspicious time for such pursuits, because a demonic skeleton has been hunting hunters. Yet, for some reason, the fiend likes this hunter. First he gives the man a seven day extension before eating him. Then he offers the man a deal—he will be spared if he leads the skeleton to his village. Stalling for time, the man will have to defeat his new “friend” with only the help of his talisman and his trusty hunting dog. There are real stakes in Skeleton, as well as a rather macabre sensibility, which is why it is even grabbier than Bai Bin’s environmentally-themed An Apple Tree. In both films, the vibrant Thangka colors and stylized figures are unlike anything you have seen in animation before. These are unusually striking films that tap into centuries-old mojo. Any self-respecting animation fan needs to check them out. In contrast, several of the other animated selections are much less accessible to mainstream animation fans. Zhong Su’s Perfect Conjugal Bliss and Ding Shiwei’s Double Act play a double game, contrasting and conflating images of the authoritarian state with post-industrial decay and class stratification, respectively. Visually, they are often surreal, which helps confuse the censors and maintain plausible deniability. This is even more the case with Zhang Yipin’s How, a sort of distaff, dystopian Little Nemo, and Qiu Anxiong’s abstract, avant-garde environmental apocalyptic fable, The New Book of Mountains and Seas Part 2. While Zhou Xiaohu’s Mirror Room holds considerably fewer political implications, the sexualized gender-bending imagery is even more likely to provoke the Puritanical authorities’ wrath. After Bai Bin’s film, the next most aesthetically and emotionally engaging selection is easily Chen Li-hua’s Family Reunion. Following the trials and tribulations of A-mei, an aboriginal migrant worker, it too celebrates regional cultural traditions, while dramatizing the challenges faced by itinerant laborers. While somewhat uneven, the collected independent animated shorts are often challenging both in terms of visual style and thematic substance. However, the preponderance of ambiguous narrative forms eventually blurs the constituent films together. Still, the program is well worth seeing for the wonderfully rich and distinctive work of Bai Bin and Chen Li-hua. Recommended for connoisseurs of animation and experimental film, Cinema on the Edge’s animated film program screens this Thursday (9/10) at the Museum of Chinese in America (MoCA).